Get involved in weeding, mulching, composting, planting and grow your own veggies! This is a great way to learn new skills and meet new friends. Gardening sessions are open to all staff and students. The Melbourne community garden is always open. During semester there are two gardening sessions per week, and every year we sell leftover produce in the Agora for gold coin donations. Contact the community garden at communitygarden@latrobe.edu.au or our join our Facebook page 'La Trobe Community Garden Group, Melbourne'. In Bendigo, ‘The Patch’ is open during semester on Tuesdays from 3 to 5 pm. The Patch has a number of growing beds in tractor tyres that can be used to grow your own vegetables. We welcome people with no experience and can provide tips and advice on growing vegetables. The Patch is located on the western side of the Applied Sciences building, above the Keck St/Sharon St roundabout. Contact us at thepatchbendigo@gmail.com. 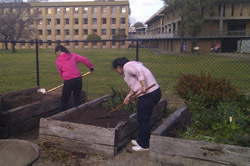 The Albury-Wodonga community garden is open throughout semester. To arrange a plot to rent and a session time contact Dr Dennis Black at d.black@latrobe.edu.au or Albury-Wodonga Sustainability at sustainability.aw@latrobe.edu.au.